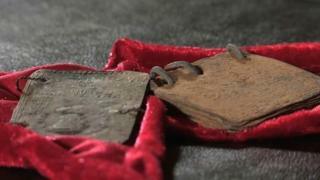 Questions have been raised over the claims of a self-styled archaeologist who is arguing that a set of supposedly ancient Christian books is genuine. David Elkington, from Gloucestershire, has raised tens of thousands of pounds to support his work proving the authenticity of the Jordan Codices. A BBC investigation found that academics have cast doubt on Mr Elkington's claims the codices date back to the 1st Century AD. Mr Elkington insists the codices are genuine and he will pay back any loans he has received. Among his backers was Princess Elizabeth of Yugoslavia, who funded his work and trips to the Middle East. She now believes the codices are not authentic and has asked for the return of her funding. Mr Elkington's companies have also received thousands of pounds from investors over the years for a film project, which he says is now on hold. He now plans to release a book about the codices, called Divine Revelation, and to produce a film based on it. He has also tried to raise sponsorship in America. Mr Elkington, 50, claims to have previously published a "highly-acclaimed academic thesis" and to have trained under a curator of the Petrie Museum in London. His book was a self-published work and the woman he trained under was never the curator of the Petrie museum. He says he has a team of international experts working on the codices but was only prepared to offer the names of two academics currently advising him. They declined to comment. The codices were found in Jordan but are currently held in Israel. The Israel Antiquities Authority has examined some of the codices and a spokesman said: "They were shown to experts on the period; all the experts absolutely doubted their authenticity." The Jordanian government has yet to make an official announcement. However, Dr Peter Thonemann, a lecturer in ancient history at Oxford University, said: "I'm as certain as it is possible to be that this entire body of codices are modern fakes. I would stake my academic reputation on it." Robert Feather, an author who has also seen the collection, is also sceptical about Mr Elkington's claims the codices are ancient Christian texts. He said: "While David Elkington continues to push the idea that these are incredibly important early Christian documents then speculation will be rife and the story will go on and on." In a statement, Mr Elkington and his wife said: "We acknowledge a small personal debt owed to (Princess) Elizabeth, which has never been disputed and will be paid back in full. "David has never claimed to have had any formal qualifications and has been largely self-taught and has worked as an independent scholar. He has always been upfront about this." The full story can be seen on Inside Out in the West, South and west Midlands on BBC1 on 26 November at 19:30 GMT.